Before Jesus did anything in public ministry, He received affirmation from His Heavenly Father. Before He performed one miracle or healed one sick person, He looked upward to His Father and of course, the Father responded by declaring publicly His love and acceptance for His Son. The Bible says in Mark's account of Jesus' Baptism (Mark 1:9-10) that the windows of heaven were actually 'torn open', using the same Greek word (skhid'-zo) where the temple curtain was 'torn' from top to bottom when Jesus died on the cross. 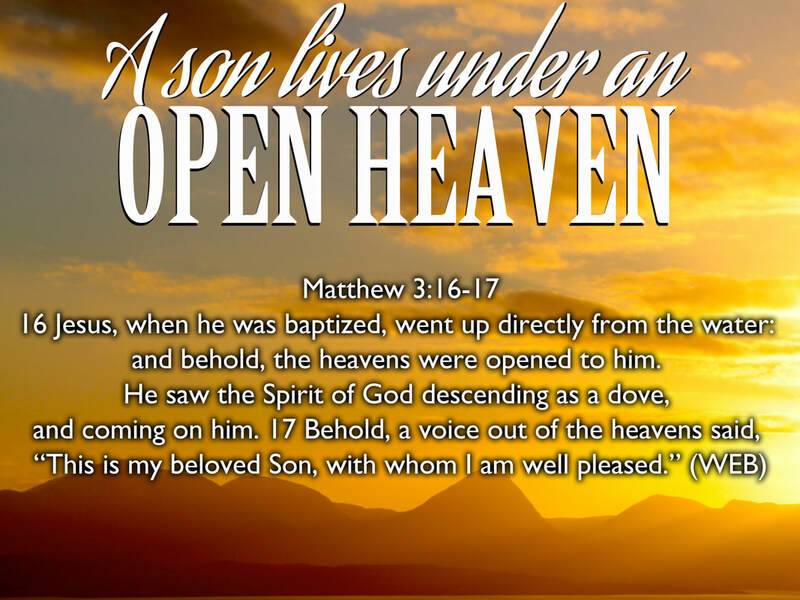 The open heaven that begun at Jesus' baptism never closed again and because of His finished work on the cross, we too, enjoy that same open heaven as well. If Jesus lived under an open heaven and we are called into the 'greater works' (John 14:12) of the Son, then it only stands to reason that we can enjoy an open heaven lifestyle too. I love how Jesus puts some form to what an open heaven looks like when He tells Nathanial that he will see angels ascending and descending on the Son of Man (John 1:51). That's as open heaven as you can get! Since we are called to look with the eyes of faith into the unseen and eternal (2 Corinthians 4:18), my prayer is that the Spirit of God would give us eyes to see from heaven's perspective (Ephesians 1:17-18). I pray that we could enjoy all of the benefits of an open heaven living as beloved heirs of God (Galatians 4:6-7) simply because it is part of our royal birthright. Nothing more. Nothing less. Those of us who still struggle with orphan mindsets still might not be convinced that this is true. If we aren't convinced that we are loved completely by a loving Father, we might live as if we are left to figure out life on our own. Instead of us basking in the glorious warmth of an open heaven's love and acceptance, we may feel disconnected, unloved and alone. But that my friends, is NOT the gospel! Jesus died on a cross so that His Father could become YOUR Father (John 20:17). You are no longer an orphan (John 14:18), but a much loved child of the Most High who is an heir to every spiritual blessing that exists in heavenly places in Christ (Ephesians 1:3).